This past weekend, three teams of four competed at the annual Academic World Quest competition held at Vegas PBS. The event is sponsored by the World Affairs Councils of America, which holds 43 state competitions nationwide each year. 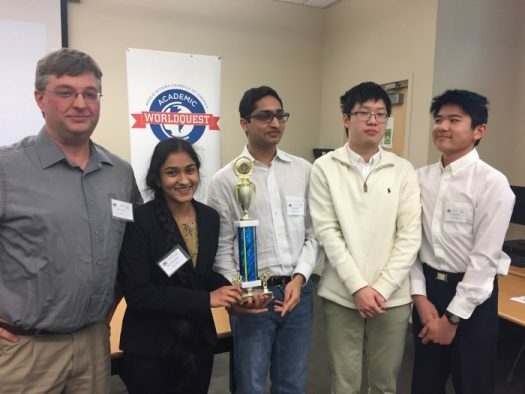 Each spring, the winners of each local competition are awarded an all-expenses-paid trip to compete at the national tournament in Washington D.C.
Last year, Clark’s team – advised by biology teacher Mr. Snow and led by club president and current UCLA freshman Cassandra Ho – placed second and third to West CTA. It was the first time Clark had competed, and they left with certainty that 2018 would be their year. And place well they did. Clark swept the competition, defeating both of Southwest CTA’s teams. Last year’s winning team from West CTA did not compete this year. Congratulations to the winning team, who will be representing Southern Nevada in our nation’s capital in April: freshman Nicholas Ho, sophomore Eshaan Vakil, and juniors Shreya Kamojjala and Eric Yuan. Clark’s other two teams also took second and third at the competition.